Just some more awesome goodies from the Target Dollar Spot! 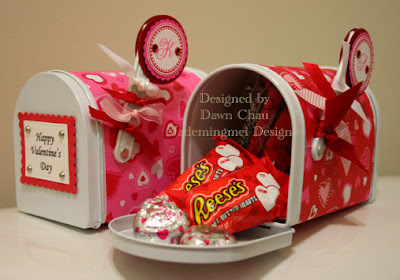 The mailboxes AND paper are from Target. My mailboxes are left over from last years stash! We didn't have any at the Target near me, so I sent out an FYI email to my family...my dear sister in CA sent me 30!!!! She is too cool...even went to two different Target's to find these sweet treasures:) This was also the first time I used my Crop-A-Dile....I'M in LOOOVE! No more hammering late at night and keeping the crickets up! To keep things simple, I made a template from last year and kept it so I know where to place my hole punch around the flag. Once you punched the hole, just make a simple slit cut that will allow you to fold your paper around the screw hole. You can modpodge if you like, but I prefer sticky tape:) I added a few scrap ribbons and trimmed them nicely. The monograms are done with my PTI set as well as the Borders and Corners Limited Edition-Dotted Circle. I used my marvy scalloped circle punch and matted it directly onto the plastic flag. On the front lid, I used my nesty rectangle dies and added some MM silver brads. I popped up the whole sentiment with dimensionals. Once your done just fill up with some yummy goodies! 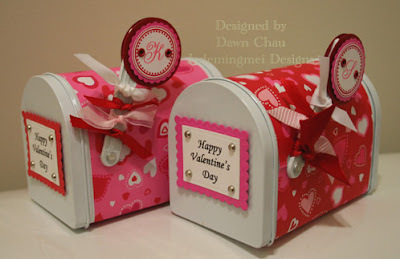 You could also use these mailboxes for baby & wedding showers....oh soo the possibilites! These are going to my Daughter's pre-school teachers this week!